The L’Isle-sur-la-Sorgue Sunday market is the largest outdoor market in the idyllic Luberon area within the Provence region of France. The large Sunday market at L’Isle-sur-la-Sorgue is a food market, flea market, and antique market rolled into one so you can buy everything from olives to fine art here. 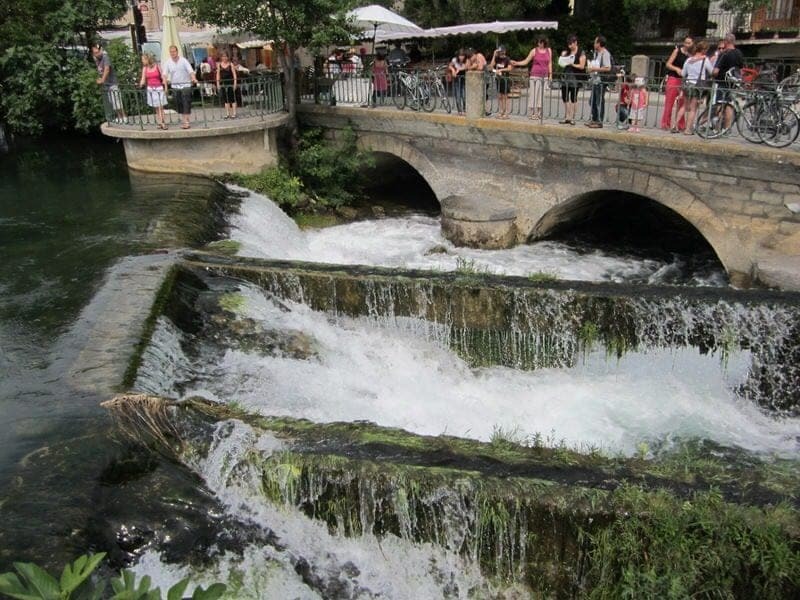 The town itself stretches across the Sorgue River—earning it the nickname “Venice of Provence”—and makes a very lovely backdrop to this large market with its shade-providing plane tress, babbling river, historic waterwheels, and flower-filled riverside cafés and restaurants. The town is famous for being a big hub for antique dealers and is the second largest antique center in France (after Paris). Interested in visiting this famous Sunday market? We’ll share everything you need to know to plan your trip to the L’Isle-sur-la-Sorgue Sunday market and tell you about our own experience visiting L’Isle-sur-la-Sorgue. When & Where is the Market? 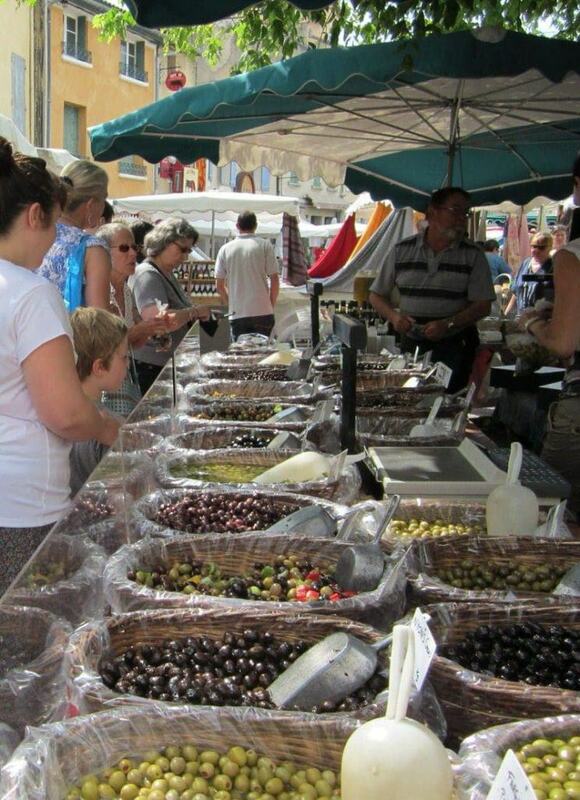 The market is held on Sundays in the town center of L’Isle sur la Sorgue. The market generally really gets going between 9am and 9:30am, but it is advisable to arrive by 9am or earlier to ensure good parking. The food and produce vendors normally start packing up after lunch so get here in the morning if you want to do some food shopping, but the other vendors selling bric-à-brac and antiques will stay open until late afternoon. Car: There is a bit of a gritty urban sprawl around the town but just bypass that and head towards the ring road and town center. Parking is available, both paid and free, but parking can be difficult, particularly from Thursday to Sunday. If you are going on a market day, try to arrive early in the morning or just come with some patience. Look for spaces as you get close to the ring road that circles the town center and then drive along the ring road and look for parking spaces. You might also try looking for parking at the train station is you can’t find anything near the ring road. Train: The town’s train station is located a short walk from the market area beyond the ring road. Bus: The local buses within the TransVaucluse network make stops in and around L’Isle-sur-la-Sorgue. The most common bus for tourists is the Line 6 bus that arrives and departs from Avignon. Other buses, such as 13.1 and 13.2, also stop in L’Isle-sur-la-Sorgue. You can check online for the latest TransVaucluse bus schedules. How Long Should I Plan to Spend at the Sunday Market? I would allow yourself at least 2 hours to find parking, visit the market, and do a little walking around town. If you want to spend more time exploring the town, stop for lunch, or do some antique shopping at the numerous stores, allow yourself extra time. I would recommend planning to spend half a day here to really enjoy the town and market at a leisurely pace. Where Can I Find More Information about L’Isle-sur-la-Sorgue? The L’Isle-sur-la-Sorgue Tourist Information Office is located in the town center near the church off Place de la Liberté. You can also call the Tourist Information Office (tel: 04 90 38 04 78) or visit their official website for more information. You can check out a map of L’Isle-sur-la-Sorgue here. The best tip is to arrive early to avoid parking hassles. By early, I would suggest arriving by 9:00. We arrived around 8:15 and we had no problem finding parking. Don’t leave valuables in your car (or at least hide them in your trunk) and take everything you need with you (e.g., sunglasses, camera, jacket) so you won’t have to waste time walking back and forth to your car. If you arrive early as the vendors are still setting up, take the time to stroll along the river, see the waterwheels, the church, and stop for some breakfast or coffee. The place will soon be overrun with hordes of people, making it a bit more difficult to enjoy the pretty setting. Come prepared with cash or stop at an ATM, especially if you want to make smaller purchases as some vendors don’t accept credit cards (or may not be able to run your credit card if not Chip-and-PIN). The more serious art and antique dealers will take credit cards. Be prepared to shop around if you want the best deals on common items (e.g., produce, soap, linens, souvenir items). We saw wide variations in prices on the same or similar products across vendors. 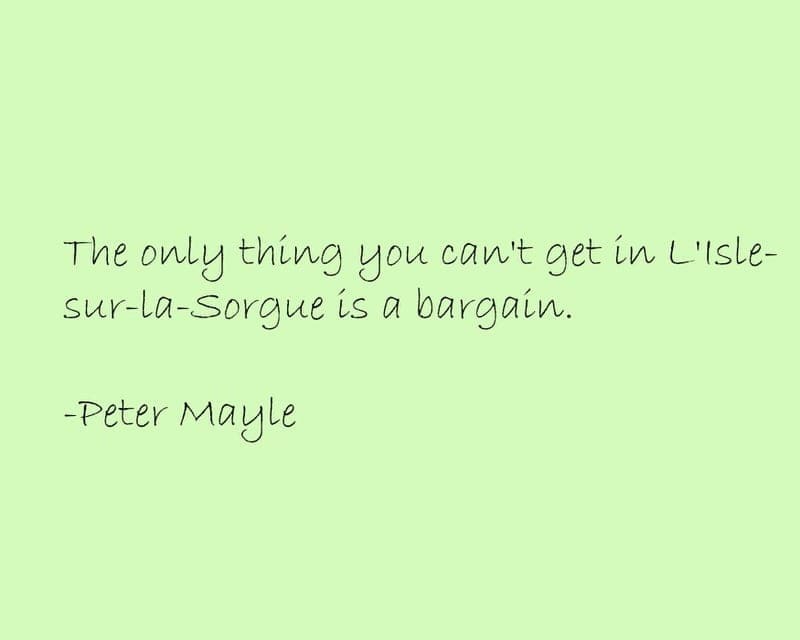 Don’t expect bargains on the antiques. While I am sure people do sometimes uncover rare finds, most of the dealers are experienced and price their goods accordingly. If you are wanting to spend some time seriously checking out antiques in L’Isle-sur-la-Sorgue, you might want to look at the town website which lists some of the larger antique dealers and their specialties. Once in town, a good place to start is the large antique center called Le Village des Antiquaries de la Gare (2 bis avenue de l’Egalité, closed Tuesday-Friday) which is one of the largest antique centers in town with dozens of dealers. You’ll find numerous antique shops and art galleries scattered throughout the town and could easily spend a whole day or two antique browsing. 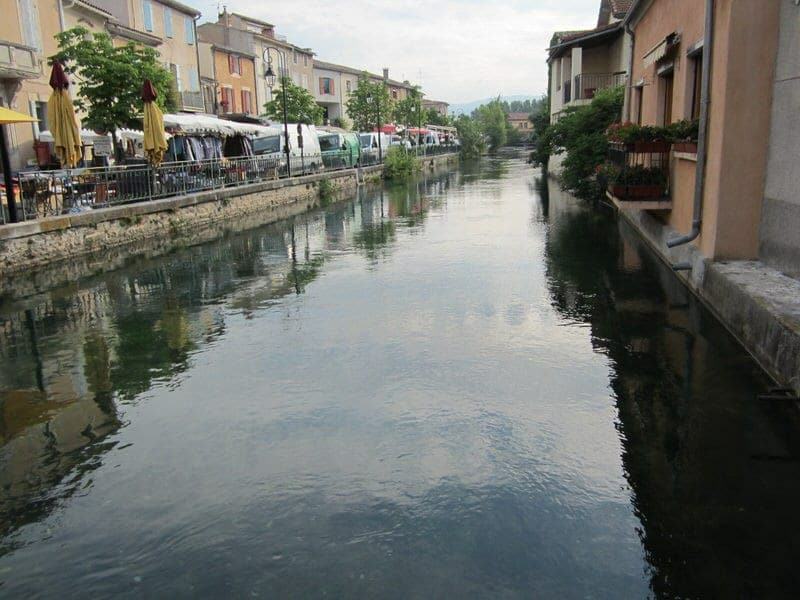 If you are planning to stay in L’Isle-sur-la-Sorgue for a night or so, it might be best to arrive on a non-market day. This way you can get settled in and explore the city as it normally is and then watch the transformation as it erupts into a busy market town. We had just arrived in the Luberon the afternoon before and our trip to the Sunday Market at L’Isle-sur-la-Sorgue was our first Luberon adventure. We had a pleasant drive to L’ Isle-sur-la-Sorgue from where we were staying near the Luberon town of Bonnieux. We arrived early (around 8:15am) and drove straight to the old town center, and had no trouble finding free parking right outside the ring road. Vendors were still arriving and setting up and there wasn’t much of a crowd yet. We took advantage of this relatively peaceful time, and walked along the river a bit and took in a few of the waterwheels. 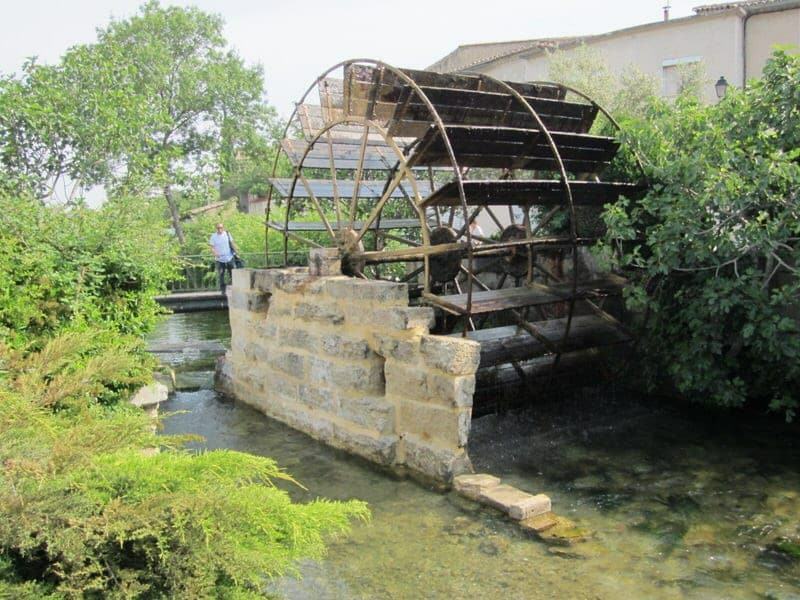 There are seven or eight of these waterwheels scattered around town serving as reminders that L’Isle-sur-la-Sorgue was a very active industrial center in the past. 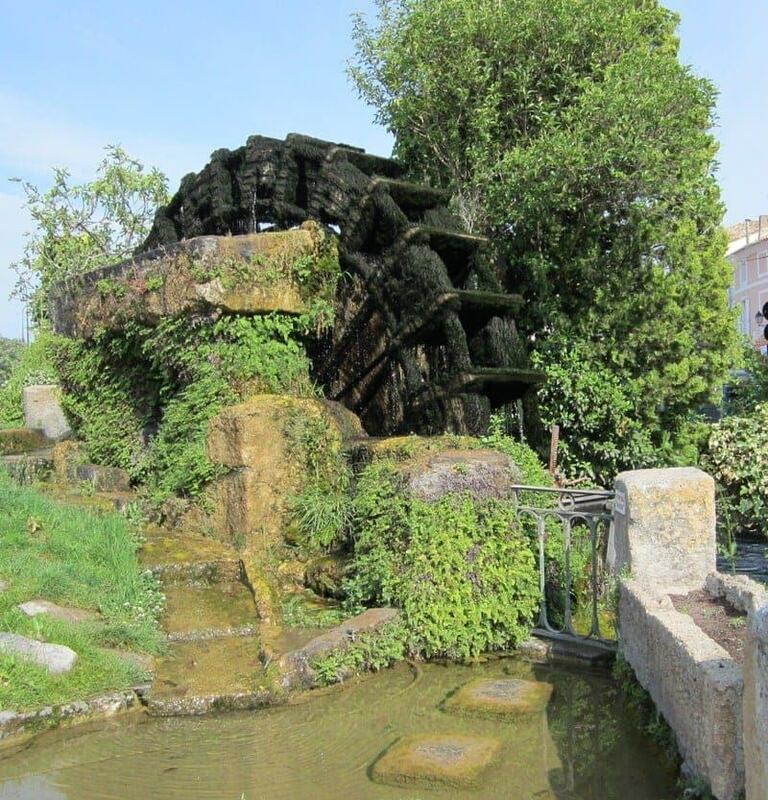 These large waterwheels, and dozens of others, were used for things such as dyeing fabrics and powering olive and paper mills. 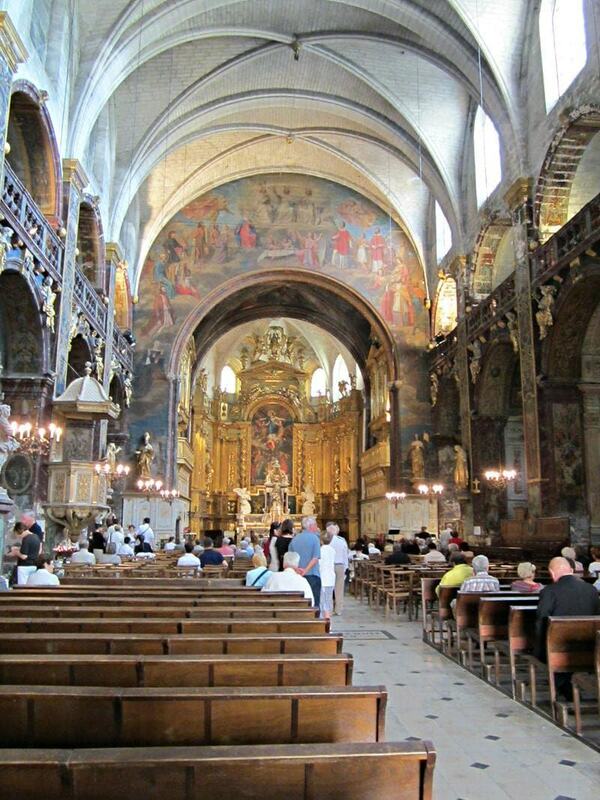 After seeing some waterwheels, we headed back to the town center and popped into the Collégiale Notre Dame des Anges (Our Lady of the Angels)—a church with a beautiful Gothic interior—and then took a look at the most-photographed café in town: Café de France. 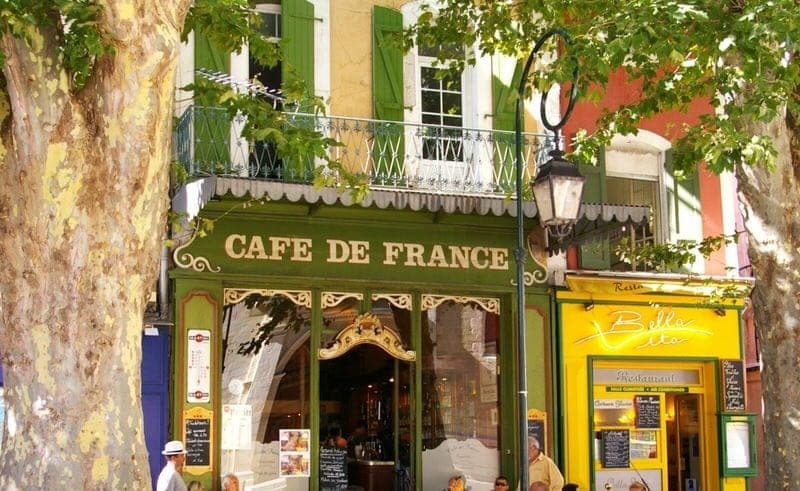 Café de France really is a pretty café with its bright green façade and being framed by two old plane trees. However, we decided to look for a table elsewhere as it was a bit crowded so we found a smaller less crowded café further on and each ordered a café crème. From the café window, we watched as the vendors set up their tables, put out their wares, and the crowds begun to form. We lingered over our coffee and then made our way out into the warm morning sun to enjoy the market. The market was now erupting with life and would continue to get busier over the next hour and a half we spent there. The Sunday market is like a food market, flea market, and antique market rolled into one and you’ll find an endless smorgasbord of things to check out: fresh produce, cheese, olive oil, linens, pottery, antiques, art, old furniture, clothing, candles, books, etc. etc. We had come to the market mainly to browse, but also with the intention of doing some food shopping. Now, one thing we noticed as we spent more time here is that given that there are so many vendors, there are likely to be multiple vendors selling very similar items. We particularly noticed this when checking out prices for soap and sausage, and some of the prices varied fairly widely. It seemed that we got a good price for the soap, while we overpaid for our sausage. So learn from us, and if you are on a budget, check around before making your purchase. Our French was quite limited at the time and we only knew some basic words and phrases; but with some patience and lots of pointing and nodding, we had no problem navigating the market and buying several things. The vendors here are very used to interacting with non-French speaking tourists. Among our purchases were melons, peppers, strawberries, spices, soap, and some poive sausage (pepper-crusted sausage which is a favorite of mine). Our budget didn’t allow for some of the very interesting old household items and art we saw, but it was enjoyable to just browse. If you are looking for a small, intimate market in Provence, this is not it. However, if you are looking for lots of variety, want to check out some antiques, or just want the experience of seeing the hustle and bustle of the largest market in the Luberon, you’ll enjoy this market. If you are wondering where all that water comes from, we later examined the source of the Sorgue River at the nearby town of Fontaine-de-Vaucluse. What do you think? 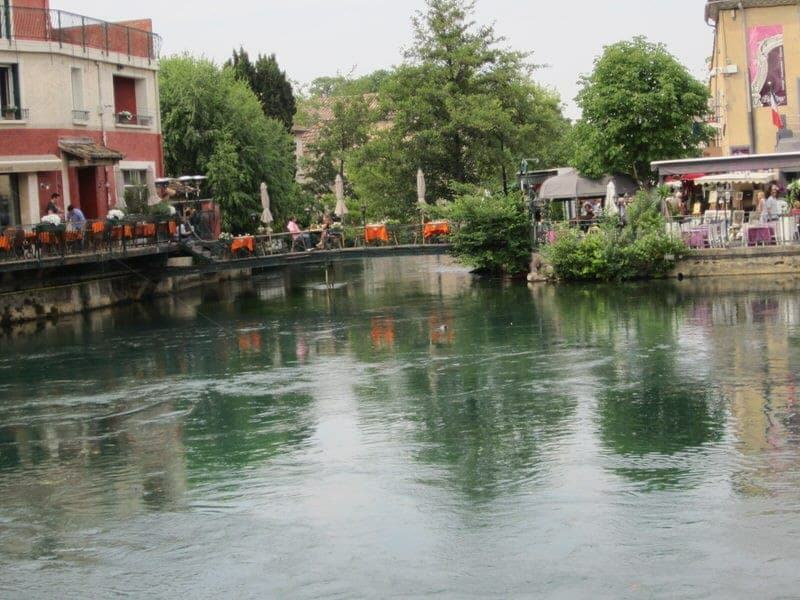 Have you been to L’Isle-sur-la-Sorgue? Feel free to share your own tips and advice with us, we love hearing from you! Going in a few weeks and am wondering if a three night stay is too long. Would there be enough to do and see for a longer stay? Hello, I guess it depends on how long you plan to be in the area and your sightseeing priorities. The Sunday market is worth a half day, the town itself is also worth a half day of exploring on a less crowded non-market day. I don’t think the town itself is worth 3 days but it can be a base to explore nearby towns like Fontaine-de-Vaucluse, Carpentras, and Cavaillon if you have a car. 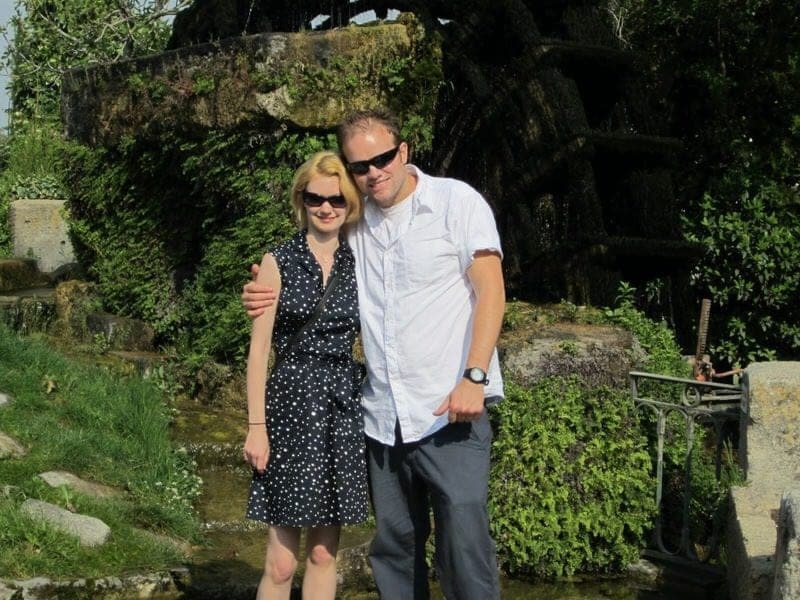 We visited Fontaine-de-Vaucluse on the afternoon after going to the Sunday market and you can read our post on that visit. Have a great trip! If you can, do the kayak trip down the Sorgue from Fontaine De Vaucluse, we are just about to do it again after visiting the fab market of course! Thanks Maria for echoing that rec. We would love to do this on our next visit! Thanks for all the lovely information. It will be very useful when we go next year. Soo looking forward to it. Thanks Jacqui, I hope you have a great time in Isle sure la Sorgue and Provence. It is a lovely area of France and a place we hope to spend more time. Feel free to contact us if you have any questions! 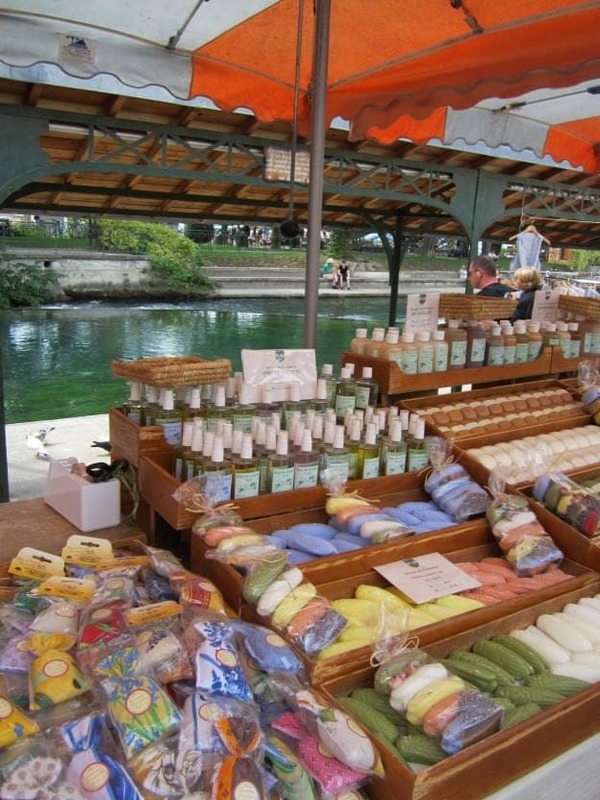 Have fun at the L’Isle-sur-la-Sorgue market, it’s a lovely region of France to explore in the Spring or Summer. Yes, the pics are lovely! I love going to local markets. I think they’re a great way to meet the locals and maybe pick up some nice souvenirs! Will definitely check this one out if I’m in Provence on a market day. Yes, we love the French markets. Some are quite big like this one and the one in Vaison-la-Romaine which are fun to visit for the hustle and bustle and variety of goods. 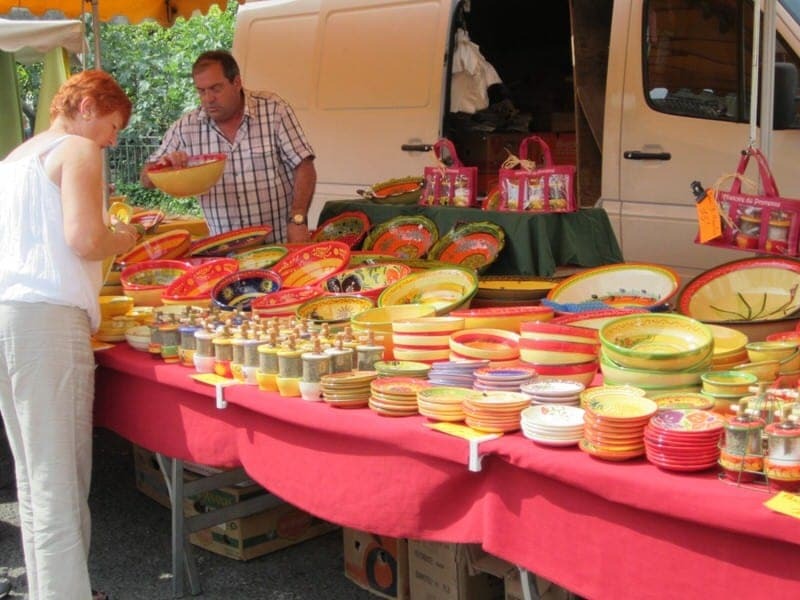 But we also like to visit a couple of the smaller ones like the Friday market in Bonnieux where you’ll see a lot of the town’s people come to do their weekly shopping. Gorgeous photos! Makes me wish I was there. Pinning. Yes, it is such a colorful market. If you are ever in Provence, you should try to visit.